CEA's Fundamental Research Division (DRF) is active in the fields of physics, chemistry, biology and health, materials sciences, climate sciences and the environment. Within this department, the IRIG institute, created on January 1st, 2019 by bringing together 3 former Grenoble institutes of the DRF (IBS, BIG and INAC), conducts research in biology, health, nanosciences, cryotechnologies and new technologies for energy and the environment. Physicists, chemists, biologists, physicians, computer scientists and mathematicians participate jointly in this fundamental research and the applications that result from it, giving the institute a remarkable capacity to respond to major societal challenges. IRIG welcomes about 1000 people who carry out their research activities in a joint research unit (UMR).  The 10 UMR of the institute are supervised by the CEA and University Grenoble Alpes; some of them have additional trusteeship which may be the CNRS, Inserm or Inra. These UMRs are grouped into five disciplinary departments. The scientific excellence that is developed within the teams and all the expertise gathered within the IRIG allow the development of multidisciplinary research. This research is based on a very exceptional park of research platforms and infrastructures: FRISBI (National Infrastructure of Integrative Structural Biology), ProFI (National Proteomics Infrastructure), PFNC (Nano Characterization Platform), Upstream Technology Platform (PTA), 400W cryogenics station, CRG ESRF & ILL lines, Integrated Structural Biology Platforms, etc. Research work is generally carried out in the framework of national and international academic partnerships; they lead to many applications, allowing IRIG to develop and develop industrial partnerships with start-ups, SMEs and large companies.